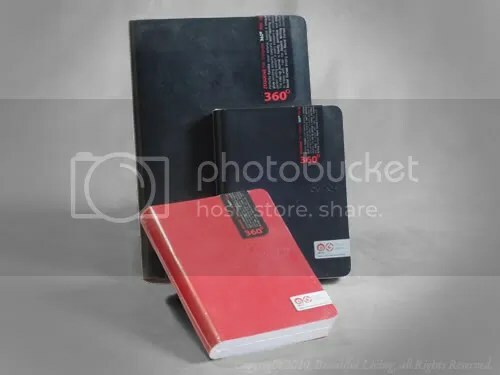 Zequenz Notebooks are available in red and black in 3 sizes. For those of you love notebooks, check out the newest design in notebooks, from Zequenz. These lovely little notebooks feature curves, and lots of them. 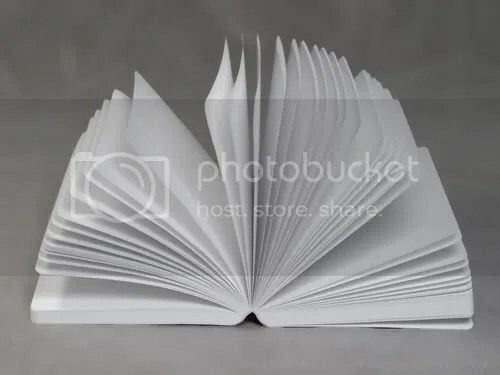 The most unique feature is the curved spine, which allows you to open the book completely or 360 so front and back covers touch. A flexible binding allows you to shape the notebook into a curvaceous roll and rounded corners are curved more than most, adding an elegant look to the design. The flexible, curved binding allows the journal to fold back onto istself. 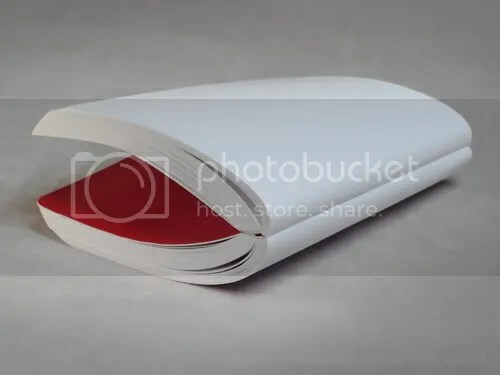 Rather than including a bookmark that is attached, Zequenz notebook include a small magnetic bookmark that folds over a page (or several) and holds your place. 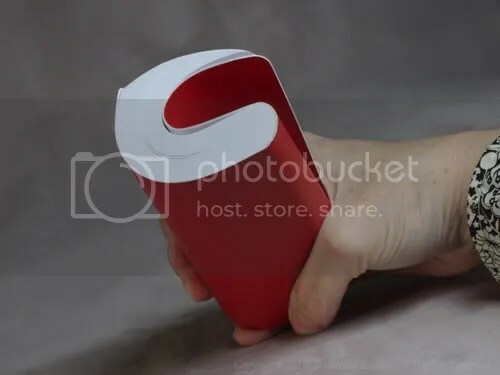 It is a clever design, but you may find that it is easily lost since the magnet is not that powerful. You may also want to keep it away from any electronic storage devices so it doesn’t damage your data. ruled & squared formats 200 pgs., plain 140 pgs. ruled & squared formats 128 pgs., plain 85 pgs. The paper inside is white and very smooth. It reminds me a little of Clairefontaine paper, although not as bright or refined. The plain paper is heavier than the ruled paper and would work well for sketching with pens, pencils and markers and will even handle light washes of watercolor without complaint. Pent test on the ruled paper yielded excellent results. There was no bleedthrough on the fountian or roll pens and the showthrough was minimal. The only ink that bled was the Sharpie permenent marker, which was expected. The paper performed well with all of the pens I tested and had little showthrough. This test was done on the plain pages. The fountain pen sample smeared a little because I did not allow the ink to dry before writing additional lines. I had good results with both the plain and ruled paper. 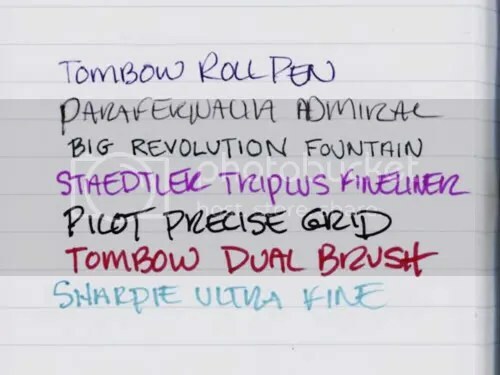 The ruled paper performed very well with almost all of my favorite pens, including the fountain and rollerball pens. The only bleedthrough I experienced was using the permanent Sharpie markers, which was expected, but the real surprise was that the Pilot Precise Grip did not bleed through at all. There was some showthrough, but it was not enough to keep me from using the back side of the page. The plain paper version has heavier paper, so there was even less showthough, but the Pilot Precise Grip had small areas of bleedthrough. I also experienced a little bit of feathering with my $2.00 ink cartridge from a big box office supply store. I can’t say whether the feathering was a result of the paper or ink, but since the rollerball ink had no feathering, I believe the feathering was due to ink quality, not a problem with the paper. 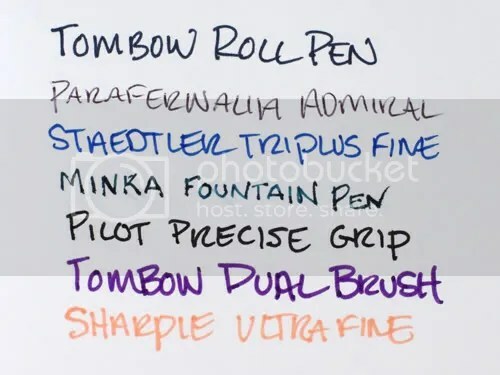 The water-based Tombow Dual Brush Pens performed as you would hope they would. Smooth lines and no showthrough or bleedthrough. 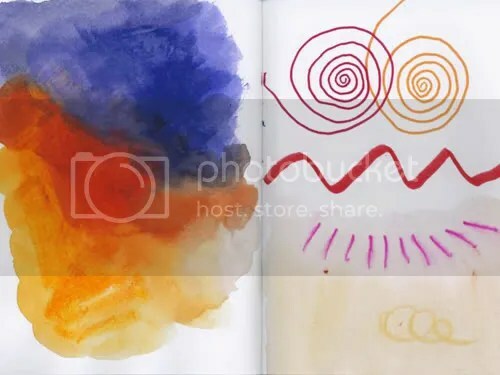 The paper, while heavier than most plain paper notebooks, still suffered from some curl when exposed to watercolor paint, but the paint did not bleed through and the curl was minimal. The paper in the plain Zequenz notebook held up well to watercolor and markers. The paper buckled a bit with the paint, but nothing surprising. There was no bleedthrough of the paints nor waterbased markers, even in the areas of heaviest coverage. The unique binding enables this notebook to open flat, even when the journal is new. The curved spine allows you to contort the journal and fold it back onto itself. If you use fountain pens or other wet pens, you should consider trying a Zequenz notebook. The paper is smooth and bright and you may find that your pen and ink combination will give you satisfactory results. Zequenz notebooks have more pages than other, similar sized notebooks and have a unique binding that opens flat and can be bent back on itself. If you write a lot, this can help you reduce your notebook consumption. The curved binding is unique and gives this notebook a distinct personality. This enables it to open flat and be contorted into a variety of positions that are just not possible with other notebooks. If you fiddle with your journals, you may find this a satisfying trait. A variety of Zequenz notebooks can be found at Amazon.com. Review copies provided to me by the nice folks at Zequenz. Are they a bit like the Paperchase ones? Which Paperchase journals are you referring to? Paperchase makes a lot of different journals. I believe they make one with a flexible cover, but I haven’t actually seen one, so I can’t accurately compare them. Have you used a Paperchase journal with a soft, flexible cover? If so, what did you like or dislike about it? Thank you for the link. I am not sure which notebook is in the link since there is not much there in the way of a description. I don’t see a Zequenz logo on the cover. The folks at Paperchase would be in a better position to tell you if the notebook they are offering is manufactured by Zequenz. Are you currently using the A6 Paperchase journal? Thanks, Cynthia, for the review. I checked FPN, and one post mentions that Amazon-ordered Zequenzes are shipped from Washington State. That super-flexibility (for pocketability and writing/handling ease) makes it stand out, even for folks like me who prefer detachable pages. Thank you for the information, Jack! I really appreciate it. Hello. Great review! I was wondering, are the lines the same size for each notebook? Are they 7.5mm for the large 200 pg. as well? Thanks for the compliment. I do not know what the line spacing is on the large Zequenz notebooks. The large notebook I have is squared with about 6 squares per inch. I searched the internet for this information with no success. I will look into it and if I find an answer, I will post it here. Thank you for the information, Steve.